Meet the band that shaped a Lifestyle. While the original Coral Reefer Band (Marvin Gardens, Kay Pasa, Al Vacado and Kitty Litter) may have just been a figment of Jimmy's imagination, the latest lineup of the band is made up of a diverse collection of talented musicians. Michael Utley grew up in Arkansas and was heavily influenced by the sounds of Memphis soul and New Orleans rhythm and blues. During spring break of his senior year at the University of Arkansas, Utley had the opportunity to record with Bill Black's Combo in Memphis. Then, after Tony Joe White had his hit with "Polk Salad Annie," Mike was invited to play on his second album. After he graduated from college with a BA in Zoology, Mike moved to Memphis and began working full time as a musician. In February 1973, after Jimmy Buffett had moved to Key West from Nashville, he heard Utley playing on one of Jerry Jeff Walker's albums. He liked what he heard and asked Mike to play on his first ABC/Dunhill album A White Sport Coat and a Pink Crustacean. During this time, Utley was touring with Kris Kristofferson and Rita Coolidge and was the musical director of the band Speedway in the movie, A Star is Born. Simultaneously, he began touring with Jimmy and has been with him ever since. Mr. Utley has recorded with an impressive list of artists including Aretha Franklin, Sam & Dave, Brook Benton, Arthur Conley, Ronnie Hawkins, Duane Allman, Buddy Guy, Junior Wells, Jimmy Cliff, Lulu, Petula Clark, Carmen McRae, Sam "The Sham", Jackson Browne, Booker T. Jones, John Kay (Steppenwolf) and Jerry Jeff Walker. 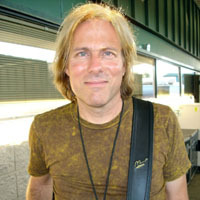 Utley is also the accomplished producer of eleven albums with Mr. Buffett. Additionally, he produced Roy Orbison's Greatest Hits album, and was producer/musical director for the Cinemax special, "Black and White Night" with Bonnie Raitt, Jackson Browne, J.D. Souther, Bruce Springsteen, Elvis Costello, and Tom Waits. Robert Greenidge grew up in the heart of the Caribbean, on the Island of Trinidad. He started playing steel drums when he was 8 years old. "My uncle Carl was a steel drum player, and made them as well, so it's a family legacy." Robert has become one of the most successful steel drum players in the world. He has toured with Taj Mahal, John Lennon, Ringo Starr, Harry Nilsson, and Brian Wilson, among others. Jimmy met Robert through a mutual friend during the recording of One Particular Harbour. Jimmy wanted a good steel drum player and it just so happened Robert lived in Los Angeles where they were recording. He went to the studio, played on two songs, "One Particular Harbour" and "Brown Eyed Girl," and has been with Buffett ever since. A hero in his homeland, Mr. Greenidge is the musical director of the legendary steel band, The Desperadoes, and he returns home to Trinidad each year to play in the Carnival celebration with them. He has also done underscoring and soundtracks for many movies. While traveling on the road together, Greenidge and Mike Utley formed their own band and recorded their first solo album in 1984 titled Mad Music, which was followed by three more: Jubilee Heat, Club Trini, and Club Trini - Back in Town. Their latest album, Late Night Menu - Club Trini Live at the Margaritaville Cafe; is scheduled to be released in the near future. Rumor has it that a special guest artist will be joining them. When Elliot Scheiner was hired to produce Jimmy's Off to See the Lizard album, he suggested that Jimmy use PM, a band which included Peter, his brother Jim and Roger Guth, for the recording sessions. Buffett was so impressed with their unique versatility as musicians and performers that he quickly hired them as part of his own Coral Reefer Band, a successful relationship that continues to date. Guitarist, vocalist and songwriter, Peter Mayer has been quietly and steadily building a fervent following across the country, stepping outside his role as one of Jimmy Buffett's Coral Reefers to front his own band, The Peter Mayer Group. Melding a unique and eclectic writing style, a distinctive voice, and virtuoso musicianship, Peter and his band create compelling and accessible music that is electrifying in live performance. Jim Mayer was born in Ambur, India. The son of a Lutheran minister, he was the youngest of eight children. Jim's earliest musical memories are of getting the Parlophone 45s from England. Before the age of five, Jim was well acquainted with "Please Please Me" and Cliff Richards' "Summer Holiday." Elliot Scheiner was asked to produce Jimmy's album Off to See the Lizard. Elliot had worked with Steely Dan and Aretha Franklin, among others, as well as with PM, the band that included Jim, his brother Peter, and Roger Guth. When Scheiner heard that Jimmy was looking for some new musicians for the album, he suggested that Jimmy use PM. Jim still remembers Jimmy Buffett walking into the studio saying, "So this is my new band!" Jim recalls, "We didn't know who the heck this guy was. We knew Margaritaville and that's it! We figured it would be a single project and maybe a gig or two. Ten years later, here we are, full-fledged Coralator Reefermegators." Jim still remembers the very first Buffett concert he played in San Diego. He could almost NOT play because he was laughing so hard at the antics of the audience, which included a giant conga line wearing enough grass skirts to cover the set of South Pacific! "God is good, life is good, and we have each other. That is my motto. Playing with Buffett and the interaction with the fans is an incredible experience. I am extremely blessed and grateful for all the gifts God has granted me ." Roger recently relocated to Nashville with his wife Kelly and son Adam. When asked what he aspires to do in the next ten years, Roger replied, "I'd like to do a lot of session work, write some great tunes, maybe try to get a record deal and help Pete (Mayer) make it big". If Mac McAnally never sang or played another note of music, his place in music history is more than assured. Writer, producer, vocalist, multi-instrumentalist and all around musical sage, Mac has seen and done it all. Now he is back once again with a new and energizing album – Live in Muscle Shoals. Recorded live from the Norton Auditorium at the University of North Alabama during the W.C. Handy Music Festival, Mac put together an incredible band of musicians consisting of fellow Coral Reefers and Muscle Shoals/Nashville session friends in which they captivated the audience. “Last summer the fine folks in charge of the W.C. Handy Music Festival asked me to play a show that ran the gamut of everything I’ve done,” Mac said. “In live performance you don’t have to look far for imperfections. I look at the imperfections as blessings too,” he added. “W.C. Handy made a career out of mixing influences from his surroundings and expressing them musically. I share that aspiration and hope to merit having shared the bill with his legacy on July 31, 2010 in his hometown of Florence, Alabama.” A master storyteller, Mac introduces each song with anecdotes, describing how the songs came to be and how they have impacted his life. Mac’s wit and love for life and music shine throughout. Live in Muscle Shoals includes his hits “Back Where I Come From”, “All These Years”, and “Down the Road”, as well as a cover of the ‘60s hit “I Heard It through the Grapevine”. The album serves as the perfect compliment to an incomparable career. Music was the most obvious road for Lyman "Mac" McAnally to take from his Red Bay, Alabama birthplace and Belmont, Mississippi hometown. He was a guitar and piano prodigy who performed in clubs at 13, wrote his first song at 15 and landed as a Muscle Shoals studio musician at 18. Mac signed his first record deal, with Ariola, at 20 and launched two singles to moderate success on the Billboard Hot 100. "It's A Crazy World" peaked at No. 37 and "Minimum Love" topped out at No. 41. His songwriting drew the attention of Jimmy Buffett and Hank Williams, Jr., both of whom cut McAnally songs. Alabama took his "Old Flame" to No. 1 in 1981. The song cemented his status as a hit maker, a reputation that has never waned. Reba McEntire, T.G. Sheppard, David Allan Coe, Shenandoah, Ricky Van Shelton, Charley Pride, Randy Travis and Steve Wariner are just some of the artists who cut Mac's songs over the next 20 years. In the late '80s and '90s, McAnally became an in-demand producer, along the way working with Ricky Skaggs, Restless Heart, Chris LeDoux and Little Feat, among others. He produced the band Sawyer Brown through their biggest successes and penned their signature hits including "The Cafe On The Corner," "The Boys And Me" and "Thank God For You." Meanwhile, Mac's skills as a musician continued to bring calls that carried him into the studio. Over the course of his career he's built an enviable registry of credits that includes Roy Orbison, Hank Williams, Jr., Amy Grant, Jimmy Buffett, Travis Tritt, Linda Ronstadt, Mary Chapin Carpenter, Dolly Parton and many more. And his guitar and vocal skills weren't confined to the studio as he joined Buffett's touring Coral Reefer band, an association that continues to this day. McAnally has also produced several of Buffett's albums and written many of his songs. And even in the midst of creating a prodigious body of behind-the-scenes work, McAnally continued to make his own music. All told, he has recorded 11 albums, all for major labels. In fact, he was the first artist signed to David Geffen's legendary rock label Geffen Records. His accomplishments are now beginning to be fully recognized. In 2007, McAnally was inducted into the Nashville Songwriters Hall of Fame. The following year, the Mississippi Musicians Hall of Fame followed suit, while the Country Music Association named him Musician of the Year for the last 3 years in a row. And, Mac continues to own and operate his own recording studio in Muscle Shoals. So the question remains: Why? Why now? Why is his biggest success and notoriety as an artist happening after he's already achieved so much? McAnally is more than confirmed as one of the most accomplished and revered creative forces in the music business. He has nothing left to prove. Maybe this time, however, the music business has something to prove to Mac McAnally. Doyle Grisham was born in Temple, Texas. His early influences included Carl Smith and Webb Pierce. He started playing guitar professionally when he was fifteen. While attending Temple Junior College, he discovered he could make more money playing music than continuing his pursuits to become a teacher. At 21, while on tour with the Big "D" Jamboree, he began playing steel guitar professionally. In the '60s, Doyle moved to Nashville, where he worked with Roy Drusky, David Houston and others, and he played the Grand Ole Opry. While working with Tompall and the Glaser Brothers at their studio and doing demos for their publishing companies, he developed a reputation and was asked to work with other producers around Nashville on their projects. It was during this period in the early '70s that he played on his first Jimmy Buffett album, which opened him to the fields of pop music as well as country. Over the years, Doyle has played with Lynn Anderson, England Dan and John Ford Coley, Dr. Hook, Bill Anderson, Buzz Cason, The Hemphills, The Rambos, The Lewis Family, Peter Yarrow (of Peter, Paul & Mary), Freddy Weller, Dickey Lee, Kenny Rogers and The First Edition, Jim Glaser, George Jones, Johnny Duncan, Reba McIntire, Dan Seals, Randy Travis, Mel Tillis, Frankie Lane, Roy Drusky and Kitty Wells, Del Reeves, Mac Wiseman, Leona Williams, Baillie and the Boys, Tiny Tim and, of course, Jimmy Buffett. In 1986, Doyle was chosen as one of the five finalists for Instrumentalist of the Year at the Country Music Association awards. During the past few years he has divided his time between studio musician and engineer, record producer, and traveling musician, most recently as the steel guitar player with the Coral Reefer Band. He has appeared on several of Jimmy's albums over the last 25 years. John started playing trumpet at age 5 because his dad was a trumpet player. He joined his school band, went to college, dropped out, and then got his first major musician job with the Tommy Dorsey orchestra. He later did a stint with the O'Jays and ended up touring with them. He eventually moved to Miami and attended the University of Miami School of Music where he played in the concert jazz band. He started working in a club called Bananas, where he had the opportunity to play with artists such as Tony Bennett, Dianne Carroll, Bob Hope, and Ben E. King. John won the Downbeat Magazine student-recording award for Outstanding Performance by a Jazz Instrumentalist in 1982. He spent time during the "fabulous 80s" at jazz radio WDNA in Miami; however, in 1987 he was a "starving musician" paying bills as a substitute teacher in the Dade County public schools. In 1992, John was selling stereos, working at a local Circuit City store and "wasn't getting anywhere." Then he got a call from a friend who was in the studio with Jimmy Buffett, where they were looking for a trumpet player. He sent a tape, resume and picture and two weeks later he got the job. John has always been a jazz player and, when he's not touring with Jimmy Buffett, he can be found playing with a local swing band in the Palm Beach area. I was born in San Antonio, raised in Los Angeles and I now reside in Atlanta. My maternal Grandfather was a singer as was my own Father so music has always been a big part of my life. When I was a little girl my parents would have me sing for their friends who would pay me a dime or sometimes even a quarter. I absolutely loved to sing and having others to sing for thrilled me to no end. In our home on any given day music could be heard. If it wasn't the radio, or the record player, one of My Father's singing groups would be rehearsing in the living room. The voices and music of Curtis Mayfield and the Impressions, Diana Ross and the Supremes, Dionne Warwick, The Temptations, Smokey Robinson, Stevie Wonder, Aretha Franklin, Donny Hathaway and the likes were my earliest musical influences. When I was 5 years old I made the declaration to my Mother that I wanted to be just like Diana Ross. I now know how blessed I am to have parents that supported and encouraged my musical interest from the very beginning. I also realize the significance of knowing at such a young age what I wanted. Of course I have had many other jobs since then but I have never veered too far off my musical path. In the early eighties I was working as a loan processor, I was also recently divorced with a young child. One fateful day I received an offer to go on the road with a major recording artist for 3 months. I was excited but I was reluctant to quit my job for something that would only last 3 months. This was a defining moment in my life. No longer could I continue to treat music as a hobby only doing it part time. I made the decision to step out on faith and use my God given talent to make a living for my Son and I. It hasn't always been easy but I am very grateful that to this day I have not had to look back. I have been earning a living with music only for over twenty years now. I encourage anyone reading these words to go after your dreams with all your heart and never ever ever give up! After that first tour I continued to audition around Los Angeles and do studio sessions. My resume soon included tours with Howard Hewet, Paula Abdul, Al Jarreau, Janet Jackson and others as a back-up vocalist. At the same time I was involved with various bands of my own many times with other family members.. We did shows around town, recorded demos and set our sights on the ever elusive major record deal. In 1992 while working outdoors, my Father was shot and killed by a stray bullet. I was devastated, we all were. About two weeks later I dreamed that I was out with friends and needed to stop home to check my answering machine. On it was a message to me from my Father, letting me know that he was okay and reminding me that I had work to do. Another defining moment for me I shook off the depression and wrapped myself in a cloak of my Father's love and belief in me and continued my journey. 3 months later I auditioned for the hip hop group Arrested Development and after working with them a year while still living in L.A. they asked me to relocate to their base, Atlanta. That was a wonderful time in my career. I loved the positive messages in their music and they way they related to our African heritage. I loved the fact that the group consisted of young men, women and an elder working side by side to bring a spiritual message to the days youth. I loved working barefoot too :) and I knew my Daddy would be proud. 3 years later the group disbanded I found myself away from my family with a mortgage, a 10 year old son and no job. I made some calls and got 3 leads: The first was another popular hip hop group looking to replace their singer temporarily for an Australian tour leaving in 2 weeks. The second was to go on the road with Yanni to sing one song per show. The third was to go on the road with a jazz singer named Jimmy Buffett. I knew the hip hop gig was only temporary so that was out. The Yanni gig was paying really well but I knew I would have been bored out of my mind doing just one song a night. I'd had some jazz experience with Al Jarreau so I turned down two and went for the jazz gig. Imagine my surprise when I received the collection of Jimmy Buffett CDs and discovered it was not what I thought! Talk about a culture shock I was actually scared. Crying, I called my Mother and said " I don't know if I can do this, I am an R & B singer with dredlocks and two rings in my nose who likes to perform barefoot! I won't fit in! She calmly reminded me that I needed a job and that if it wasn't meant to be I would find out soon enough. I worked through my fear and commenced to learning my parts. As I got more familiar with Jimmy's music I heard Caribbean influences, some Pop, folk, country, Rock and even a couple jazzy ballads. I paid attention to his lyrics and found myself thoroughly entertained and impressed by his story telling. I got a call from Jimmy's Saxaphonist, Amy Lee also an Atlanta resident. She'd called to welcome me to the Coral Reefer Band of which she had been a member for some time. Amy was so nice and reassuring I knew it would be okay. 13 years later and counting I now consider The Coral Reefer Band to be my family and I am proud to be a member. I have the utmost respect and love for each and every one of the CRB as multi talented artists and as really good people. It's been a great journey so far and getting better every day. I just finished recording a new CD on Mailboat Records, honoring Jimmy Buffett, the music and the man. "Nod to the Storyteller" is scheduled for an October 14 release. My Mom, my brothers, aunts, uncles, cousins, co-workers and friends will celebrate the release at Margaritaville in Las Vegas on October 24, 2008. It's gonna be a fun affair that you don't want to miss. If you can make it please come celebrate with us. Eric Darken has worked with some of the biggest names in the music industry. He has recorded with Taylor Swift, Bon Jovi, Sheryl Crow, Bob Seger, Luke Bryan, Carrie Underwood, Jewel, Vince Gill, Amy Grant, Art Garfunkel, Brad Paisley, Keith Urban and Willie Nelson. He has appeared with various artists on The Tonight Show, The Late Show With David Letterman, The View, Good Morning America, The Ellen Show, The Oprah Winfrey Show and The Today Show. He currently tours with Jimmy Buffett And The Coral Reefer Band. His original compositions can be heard on Dateline NBC, Fox Sports, 20/20, National Geographic, Dancing With The Stars, The Outdoor Channel, Animal Planet, The NFL Network and the feature film The Fantastic Four - Rise Of The Silver Surfer. Eric has been nominated multiple times for an Academy Of Country Music Award, winning in 2009 for Musician Of The Year in the "Specialty Instrument" category. He has also been nominated for The Gospel Music Association Dove Award, winning in 1996 for Instrumental Album Of The Year. Eric uses Meinl Percussion, Paiste Cymbals, Mike Balter Mallets, The TrashKat and Shure Microphones. For more than a quarter century, Ralph MacDonald has stood at the forefront of traditional and contemporary music leaving his indelible mark on nearly every genre of melody and rhythm. Ralph MacDonald was literally born into music. His father was MacBeth The Great, a popular calypsonian and bandleader during the 1940s and '50s. Seated squarely on his father's lap in the West Indian and Latin cultural citadels of the Harlem Renaissance, MacDonald began his early childhood education in music and live performance. At seventeen, MacDonald became the percussionist for famed songster Harry Belafonte and began a musical relationship with him that would last nearly a decade. During that time, MacDonald wrote an album of songs for Belafonte entitled Calypso Carnival. In 1971, MacDonald had begun working with Roberta Flack and during a recording session, he played a sampling of his material for Roberta. She fell in love with one of the tunes that MacDonald had originally intended to give to The Fifth Dimension. They never got a chance to hear it since Roberta claimed it for her new album and teamed up with Donny Hathaway to record the very first version of a song that would later be covered by more than two hundred different artists in over thirty languages. The song, "Where Is The Love," sold over ten million copies and gave MacDonald his first Grammy as a writer. In all, Ralph MacDonald has played percussion on nearly a dozen Grammy Award winners including Carly Simon and James Taylor's "Mockingbird," Paul Simon's "Still Crazy After All These Years" and "Graceland," Billy Joel's "Just The Way You Are," Roberta Flack's "Killing Me Softly," George Benson's "Breezin'," Bette Midler's "Do You Want To Dance," Diana Ross' "Mirror, Mirror" and, of course, "Winelight." MacDonald also won a Grammy for his performance on Bob James' musical theme for the television sitcom classic "Taxi" and as a writer on The Winan's version of "Tradewinds." For ten consecutive years, 1979 through 1988, MacDonald won the "Most Valuable Player Of The Year" award for percussion from NARAS, the National Academy of Recording Arts and Sciences.